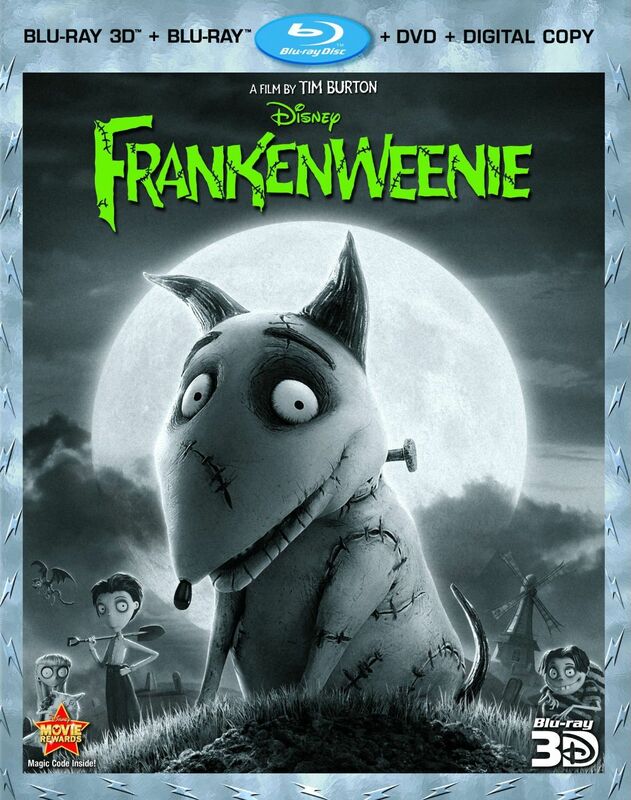 Frankenweenie was recently released on DVD and Blu-ray... and Blu-ray 3D. Can you believe we actually have that now?! Unfortunately, when I say "we" I mean other people and "not me". It's too bad because I think this would have been better to see in 3D. In 2D, I found it to be only fairly enjoyable, and only up until the third act which felt out of place. The film is entirely in black and white, which helps make it feel more like those old classic monster movies, and the main character, a kid named Victor, even makes his own monster movies using a home video camera and starring his dog sparky. I loved this aspect of the film, and think it might have been better off if it were made as a short instead of a feature film. Victor and his dog sparky are the center of attention here, and it's clear they care a lot for each other, but the film never really made me feel this connection, not like the opening of Up where I truly felt their love. So when Sparky bites the dust, I knew he was sad but I didn't feel it, I couldn't empathize. Then we knew what was coming next, that Victor would bring Sparky back to life, but it took longer than I expected for him to get to it. After he did, I enjoyed seeing Sparky go out and explorer the town with his new life, but not a whole lot was done to make him any different than he was when he was alive. And what came next just felt odd, when he brought a dead fish back to life for a non-friend, for no good reason. And it made the fish invisible for some reason? And when the secret of bringing dead pets back to life gets out among his peers, all they have to do is look at Victor's notes and they all instantly know how to do it? Except that it all goes bizarrely wrong because there's no love? I don't know, it all felt very weird. It felt like it went from a story about a boy and his dog to a mishmash of dead pets roaming the town because students wanted to win a science fair project. I think the substitute science teacher was a great character and wasn't used nearly enough. He should have been much more involved in the plot. The music is done by Danny Elfman, who is fantastic, but it would have been nice to have different music in a Tim Burton movie for a change. There is a lot here that I feel I've seen before, so it doesn't seem like a new and exciting experience. Frakenweenie Touring Exhibit - Explore the artistry of the film's puppets, sets and props in a showcase that's traveling the world. The original live-action Frakenweenie was neat to see again, and I also enjoyed the new short Captain Sparky vs The Flying Saucers. It supports my previous thought that for these characters, shorts work better than something feature length.